Twitter users love the system and are very passionate about the benefits it brings them. But increasingly, Twitter is looking like it is on its deathbed. High profile celebrities, such as Miley Cyrus (Hannah Montana) have left Twitter and Stephen Fry threatened to leave but returned. 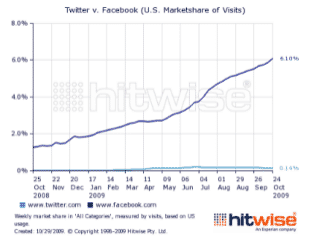 Now, new data from the web intelligence company, Hitwise, suggests that Facebook is simply overpowering Twitter. Indeed, Twitter’s initial growth appears to be falling. Over the past year, according to Hitwise, Facebook has trebled its market share of visits. Whereas, Twitter hasn’t grown; indeed, Hitwise shows that Twitter has actually fallen from a market share of 0.2% to one of 0.14%. Combine this with high profile celebrity walk-outs and a recent report suggesting Twitter costs UK businesses £1.4b a year in lost productivity and you have a perfect recipe for everyone starting to think negatively about Twitter. So, should you ignore Twitter too and take a lead from Miley Cyrus? Should you realise that Twitter is an online “flash in the pan”, something that was good for a while? Should you stop wasting your time tweeting at every opportunity? Should you heck. Here’s the problem. Comparing Twitter with Facebook is rather like comparing a text message to a book. The people who insist on making the comparison between Facebook and Twitter simply do not understand that like text messages and books, they are completely different forms of communication. In the past few years the number of books published in the UK has more than doubled. Did that mean that text messaging was near death? Of course not. Suggesting that Facebook’s increase in market share implies the end of Twitter is making the same fundamental error. Twitter and Facebook are entirely different communications vehicles that do different things. People are able to separate them in their own minds and use them differently. The market share comparison actually tells us nothing, other than the fact that the more people you have in a system, the more people you get using it. Durrr…! So, forget the naysayers, ignore the critics and use Twitter in the way you and your followers want to. It is simply a conversation and no-one can tell you what is right or wrong in such a two-way connection. Do what you want with Twitter – as long as it works for you and your followers, that’s fine.